Southwestern interior design was inspired by the Spanish settlers that converged on the American southwest and native culture throughout the 18th and 19th centuries. You don’t have to live in the southwest in order to appreciate and enjoy the design! In fact, many of our most frequent web visitors live on the east coast, but want to add a southwest flavor to their home. Sometimes described as casual and elegant sophistication all rolled into one, southwest interior design takes the rich earthy colors and textures that make up the desert flora and fauna and mixes them up with Spanish and Mexican pieces to add effect. These pieces include such things as wood carvings and ironwork. This type of interior design is relaxed, fun and laid back. It reflects the traditional lifestyle of the southwest. The essence of this design is found in the details. 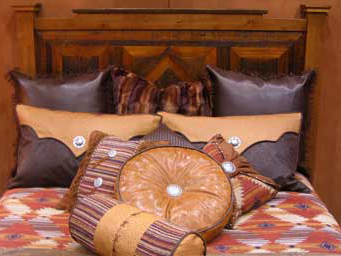 Southwestern interior design can be affordable for anyone. It is earthy, rich in culture, symbolism and meaning. Stay away from what I call “cheesy southwest” which are cheap-looking pieces that are often knock-offs and are often made by the Chinese or overseas. Look for southwest metal art made of substantial gauge metal, handpainted southwest switchplates, mission table lamps and art and furniture pieces made by native artists. If the piece doesn’t say “Native American made,” it isn’t. As far as color is concerned in southwestern interior design, think of the muted and sometimes surprising colors of the American desert. Think of colors such as rust, terracotta, deep mahogany brown and variations of the color of sand. Add a splash of turquoise, teal, red or yellow—bright colors that will give your home a festive, Mexican feel. Taken together, these colors create a look that is natural, tranquil, relaxed and welcoming. Texture is essential to your design. Elements of a home that pay tribute to southwestern interior design may include pine wooden structural beams and furniture, natural clay tile, wrought iron tables and woven grasses. Rugs are generally wool and woven in rich, geometric designs. Furniture is generous and overstuffed, covered in leather or soft fabric that gives your living room a warm, cozy, homey feel. The fabrics used for most pieces of furniture, as well as southwestern bedding and carpets is most often made of cotton, a linen blend, or wool that is loosely woven. The type of furniture you see most often in southwestern interior design runs the gamut from rustic to ornate. There are plank tables that are plain and basic, almost picnic style. But on the other hand, there are headboards and chair backs that are carved in the most complex manner with a meticulous eye for details. Geometric cutouts in metal chairs is popular, as you see in these striking southwestern bar stools. Often you’ll see cutouts of a zuni sign, cactus or Kokopelli. These same designs are often repeated in metal art that you can hang on the wall. Most furniture fitting for southwest interior design is made of wood or metal with rustic and colorful accents in the lamps and cabinet and table hardware. The Native American motif and symbolism can be carried throughout your home in upholstery, accent pillows, fabric valances, metal wall art (like Kokopelli art) and accessories. Southwestern interior design and large chests and cabinets go hand in hand. The reason for this is a practical one—most traditional 19th century homes in the southwest were not built with linen closets or closets to hang clothing.